Evolence® collagen filler is a product designed to help reduce the appearance of fine lines and wrinkles in the face. These lines and wrinkles, associated with aging, are often targets of skin care and anti-aging products. Evolence® collagen filler is injected beneath the skin, filling in the grooves and lines that form the wrinkles and sagging skin of the face as the body ages. Evolence® is made of pig collagen, which is similar to human collagen. It is mainly used to treat the lines and wrinkles around the nose and mouth, though some doctors have found it to be useful in other areas of the face as well. Irritation and infection: Like any injection, Evolence® collagen filler can cause irritation or even infection at the site of the injection. It must not be forgotten that Evolence® collagen filler injection is a medical procedure and carries all the same risks of infection that any other injection will. Hard, bumpy appearance: Many who have tried Evolence® have been extremely distressed with hard, lumpy results, instead of the smooth, supple and youthful skin they were expecting. 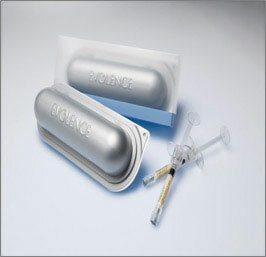 Migration of Evolence®: Evolence® collagen filler is only for use in certain areas of the face. Many have found that after injection, the material migrates and causes extremely negative effects in areas that were not to be treated. Abscesses: One of the most disturbing side effects of Evolence® collagen filler is the occurrence of lumps that turn to abscess. An abscess is a pocket of pus that forms on the skin due to infection. They can be painful, and very unsightly on the face. Abscesses require serious medical treatment like injections and costly medications. Temporary or minimal results: One of the most disappointing side effects of Evolence® experienced by many has been the extremely temporary or even minimal results. In addition to risking pain, infection and lumps, many have found that Evolence® collagen filler delivers extremely disappointing or short-lived results. Treatment with Evolence® collagen filler is a heavy financial commitment. Since Evolence® must be injected by a professional you will have to include the cost of an office visit in the price of the injections themselves, which are far from cheap. Time and inconvenience of the entire procedure must also be factored in, since Evolence® collagen filler injections cannot be done at home on your own time. Additionally, the effects of Evolence® collagen filler are not permanent. The cost is not a onetime obstacle, but instead, a regular and consistent expense will be necessary to maintain the results achieved. Evolence® collagen filler is far from the only option available for the treatment and prevention of fine lines and wrinkles. Many different types of treatments are available, and most are not as costly or inconvenient as Evolence® collagen filler injections. A high quality anti-wrinkle cream, when used regularly, will not only reduce the appearance of existing fine lines and wrinkles, but prevent fine lines and wrinkles from ever forming – all without painful Evolence® injections. An anti-wrinkle cream containing ingredients such as Hyaluronic Acid, Palmitoyl Oligopeptide and Retinyl Palmitate has been shown to provide impressive results in the fight against the signs of aging.